There are two times every gal should consider an update with their hair color...Spring and Fall. I tend to take a break from hair color in the summer so by the time Labor Day comes around, my hair is ready for some major TLC and I am in desperate need of a refresh. Having long locks and pretty committed to the long hair don't care hash tag, I crave change but since I am not chopping anything off anytime soon, I look for the change in my color. I have been eyeing Jesus Garcia's work for quite some time now and I finally bit the bullet and made an appointment. The salon he works in just relocated to a brand new lofty space on Route 66 and I had been dying to see it as well so kill two birds with one stone, right!?! 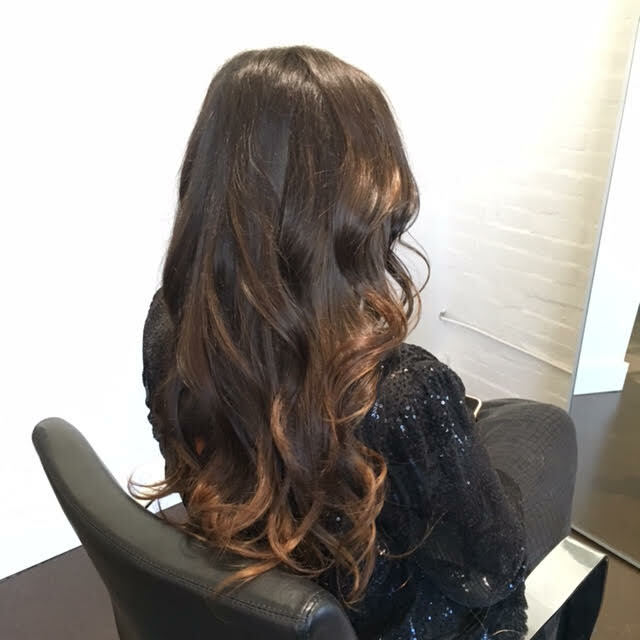 My appointment was on Monday and I am thrilled with my hair. Jesus is incredibly talented and gave me the BEST consultation and experience I have ever had. Being in the salon industry for 14 plus years, meeting thousands of hairdressers, having my hair cut and colored by some of the finest in the industry and Jesus blew my mind. Once I booked my appointment I sent over some pictures of my inspiration of what I was thinking for my color and of course I am heavily channeling Paola Alberdi from Blank Itinerary right now. I also included photos of my hair in its current state so Jesus had some time to think about it. Diva, right?! But seriously my hair is a huge deal. You know how everyone has an asset whether it's their legs or their eyes or their perfect cheek bones..well mine is my hair. It has it's own identity and I swear it should just have it's own face-book page. HEY- zero pressure at all Jesus. So I got to my salon appointment giddy with anticipation 15 minutes early Monday morning. Jesus was there already awaiting me. (Huge bonus points. It makes me feel incredibly important and shows so much professionalism) He had a huge smile on his face and was so genuinely excited that I was there. He offered me coffee and then escorted me to his chair. We then had a serious consultation to make sure we were on the same page of the desired expectation. I mean I know the importance of creating customer loyalty by mastering the consultation. I taught it to hairdressers for years. But THIS consultation you guys. Jesus just gets it. He asked several questions and was really listening to the things I was saying. He mostly talked to me vs talking behind me through the mirror. I appreciate the eye contact and 100% complete focus on my hair and me. He repeated everything back to me as I was saying it so there was no doubt we both understood one another. He even offered suggestions for my face shape and what he thought would look really good and highlight my eyes and make my face look thinner. I mean.....!!!!! The whole service was impeccable and I am hooked. He talked me through the whole entire process...what he was doing, what he was going to do next, and why he was doing it. YOU GUYS!!! Of course I had to interview him and introduce him to the world. - Full name and where were you born? My name is Jesus Garcia and I was born in Mexico City, Mexico. -At what age did you start doing hair? Favorite memories of this time? I started doing hair when I was 16 years old. My mom is also a hairdresser. She was my mentor and my teacher. -What brought you to Tulsa, Oklahoma? Well I never thought I would end up in USA but I met my wife Jennie while working in Miami. I am in Tulsa because it's the city my wife lives in. -How long have you been loyal to Davines? Why Davines? I was the Master National Educator for Davines Mexico and used Davines in my salon in Mexico for 2 and half years. Now I continue to use it everyday in the salon. ( So 5 and a half years total.) The why is because I love the concept and the philosophy for this company. Not only are the products really amazing but also the company itself is amazing. -Many people will be returning from their summer seaside trips with dry and unhealthy hair! What are your first aid tips to get the hair looking healthy again? It's true in the summer months we are in the sun and water a lot and it can be really hard on hair. I would recommend making an appointment in the salon for a consultation on the best treatment for your hair (Davines has some great ones). With an in salon appointment we can really see and feel your hair to suggest the best treatment and at home hair care products. -What hair trends are you most excited about for Fall/Winter? I am most excited about the warm color tones. This fall is all about warm browns, reds (especially copper tones) and golden blondes. -Can you suggest an everyday hairstyle for my readers? How do you create it and what products should we use? -What is your go to product that you could not live without in the salon? -What can we do to maintain healthy hair this winter? I would suggest doing a weekly treatment at home. Davines has several great hair masks. They can add moisture and shine. - What inspires you as a hairdresser? I love traveling, visiting other cities and just walking the streets (taking it all in), visiting art museum, taking photos. I am really passionate about my profession. I am constantly looking for new techniques and technologies, always growing. I have worked in the education part of this industry for almost 20 years and I love meeting and collaborating with other stylists. -How do you keep the passion alive and not burn out behind the chair? Again I am just really passionate about this industry. I love it and I really love working and what I do. - Davines colour lets you be super creative, yes? What do you love about it and what makes it different from any other company out there? Yes, They have many tools and colors (mask with vibrachrom, A New Colour which is ammonia free, Finest Pigments, Alchemic, L'art de Color, and Flamboyage strips) that really let you move and use creativity while working. I think Davines is really innovative in the color formulations leaving the hair shiny and healthy looking. - You recently just did my hair for fall and I am in love with it. Can you share what you did and why? I decided for the look we discussed during your consultation that Flamboyage would be the way we would go. Your hair was getting pretty light from being in the summer sun so I used Flamboyage to really add some rich chocolates and golden tones to your hair. I left the hair around your face darker to really bring out your eyes (brown with some green) and compliment your skin tone. For me haircuts are never really complete without beautiful color. I wanted to do something very new, very natural and spontaneous. -Flamboyage??! What do you love about this? Flamboyage is a unique color service. I love it because it allows you to create really beautiful spontaneous colors. - Long weekend in Mexico City..where should I go? What should I do? You should definitely eat tacos at Al Pastor! The taquerias in Mexico City are nothing to be compared to. I love my city. It's a magical place. There are so many great options. Our downtown is so beautiful, the history, the architecture. I love to spend my Sundays in Coyoacan. It's busy with people,there's a nice square, great food and Frida's Blue house (a must if you love Frida) is there. La Roma, my neighborhood has great restaurants and bars. My friends and I always go to Patrick Miller. It's a dance club where people have dance offs. It's pretty funny really! - Your favorite places in Tulsa? I really enjoy the parks in Tulsa, especially Riverside. For drinks I really like to go to Hodges Bend and Valkyrie. I'm still figuring out this place! - Favorite thing in your closet right now? My new black leather Vans. - What's next for Jesus? What's next? I'm always looking for new things. Seriously so impressive! Just look at my hair!!! Local Tulsa loves, I have partnered with Jesus and he is graciously honoring a 20% off discount for all new clients when you book a color and cut starting now through Oct 1st. Only stipulation is that you must get into the salon before November 1st. When booking tell them Go French Yourself sent you! And check out Jesus's amazing work right here. Parlour's new location on Route 66 is just stunning too. So happy for my friends Jennie and Michael! They just merged ownership and I look forward to interviewing them soon on this process! They will also be having an amazing open house event in October so be sure to add them on facebook so you will be the first to know all the deets. Go see Jesus and shoot me your before and after pics please! I want to see!